Salad challenge posts: Introduction, Sweet + Creamy Broccoli Salad, Green Goddessphere at Sea, Spinach Salad with Tomato Vinaigrette, Cucumber Dill Kale Salad, and Hot and Wild Roasted Veggie Salad Around mid-October I realized that having one salad a day; whether it be for lunch or dinner, had a dramatic impact on my mood, digestion, and overall wellbeing. I felt light, energetic, healthier, and balanced. I promised myself then and there that I’d begin bringing a salad as my lunch to work every day as a way to hold on to the good feeling I had going on. A couple of weeks into it my colleagues took notice. After I explained everything, the ingredients I chose for my salads, and how darn easy it had become to pack my lunch every morning, some of them joined in the fun. 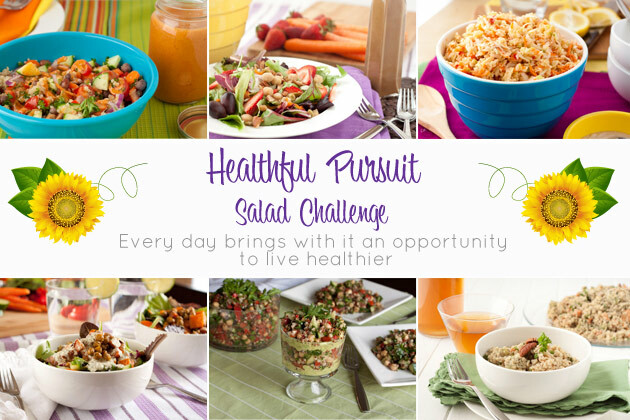 Since then, a group of us have continued with the one salad a day challenge – swapping recipes, weekend preparation tips to make lunch packing easier, and have inspired each other along the way. Through this process, I’ve experienced what committing to something so simple can do to my overall health and thought it was about time we shared in this together. 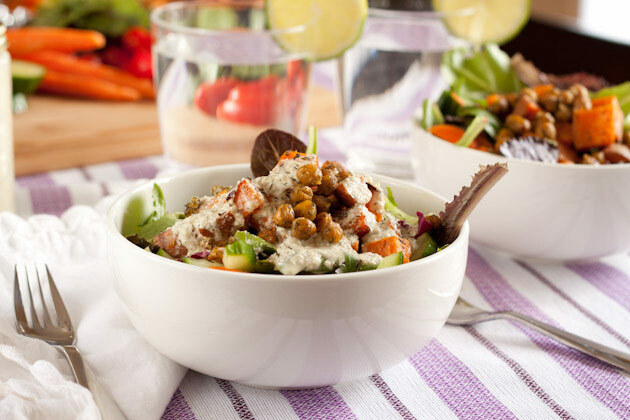 Over the next week, I’ll be posting a bunch of new salad recipes and encourage you to wrangle up whatever vegetables, grains, proteins, nuts or seeds you have lying around and join in! 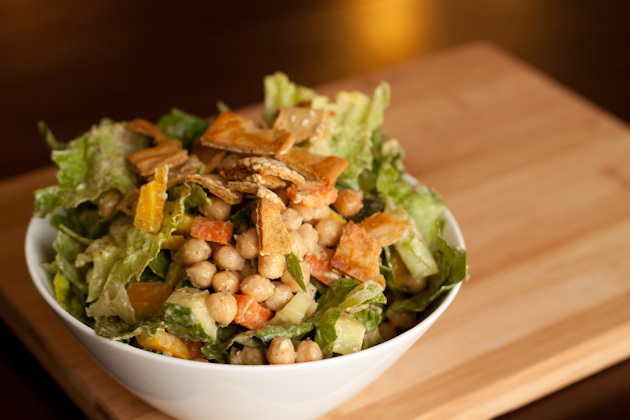 We’re going to kick everything off today by counting down the top 5 salads from last year. If you have a favorite from your own blog, or repitore of recipes, please feel free to share in the comments below. 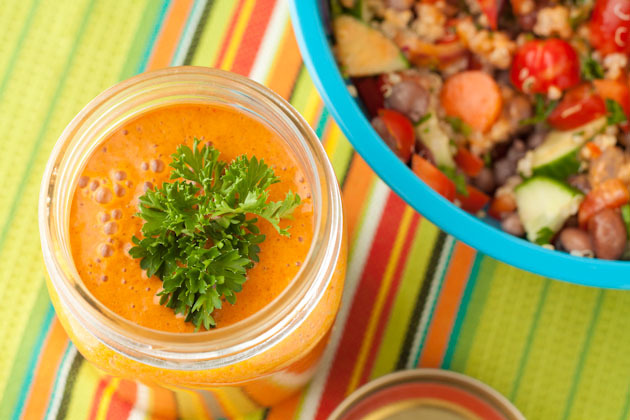 This salad dressing is creamy, light, and high in healthy fats and goes great with chickpeas, socca crackers, and carrots! 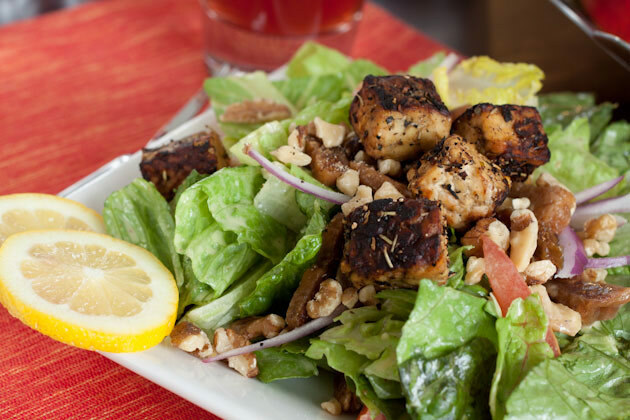 Low fat sweet BBQ flavored gluten-free salad dressings smothers this quinoa bowl. 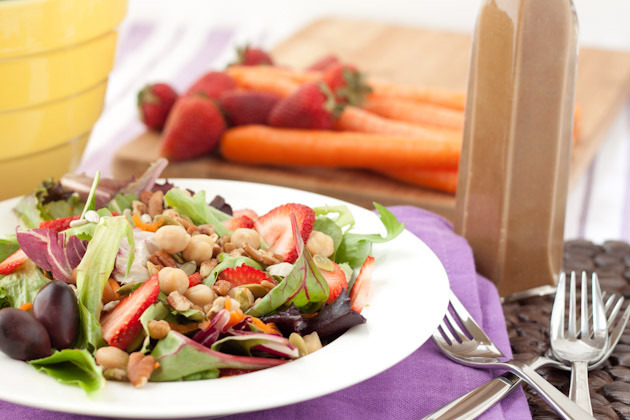 A light vegan salad, surrounded by a creamy maple balsamic dressing, olives and strawberries. 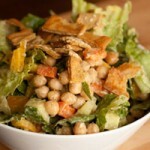 Sunflower seeds, dill, and lemon dressing poured over dill chickpeas, baked yams and fresh veggies. Let’s welcome 2012 with a produce drawer full of vegetables and a happy, healthy, radiant body. Are ya with me?